T-PAK 750 System | PAK Automation Ltd. The T-PAK 750 Large Bag Handling and Sealing System is designed for automatically sealing bags coming down a packing line or off an automatic bagging machine. 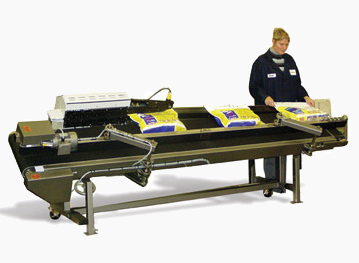 The system is equipped with a variable angled conveyor with powered back belt. The sealer is mounted to the conveyor and is equipped with an infeed. It pulls the bag up to the product. The product then proceeds into the sealer and exits with the “Perfect Seal”. Each unit is custom built to meet the need of the customer’s application. The system is a high quality concept in bag handling and sealing technology. The combination of a heavy duty conveyor system with the Band Supersealer Platform or Hot Air Supersealer Platform makes this an unchallenged heat sealing system for many applications, superior in performance and speed with low maintenance cost. 110 V, single phase, 15 amp, 20 psi. 110 V, single phase, 10 amp. Supersealer ‘hot air’ bag sealer:Optimum seal quality. Automatic bag presentation: Optimum seal aesthetics. Cold knife trimming: No fumes, no gumming. Automatic recall of product setting. Custom built conveyors: Optimum product handling. The bag top trimmer cuts the top of the bag prior to entering the heating section of the sealer. The bag is cut cold, therefore there are no fumes generated and no gumming of the blade. The jet flow trim remover uses compressed air to remove the bag material from the trimmer. The T-Pak automatically inserts bags into sealer and tensions the bag around the product as possible. All of this is done without risk of burning the product.